We have a winner at the wire in the drunkest person in the Upper Midwest contest. Marguerite Engle, 45, of Sturgis, South Dakota, was found to have a blood alcohol level of.708 earlier this month. 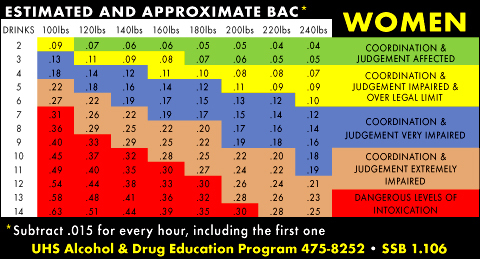 It’s difficult to know for sure because BAC depends on several factors including a person’s weight, how long it’s been since the alcohol was consumed, and the metabolism of the nearly dearly departed. But we won’t let that stop us. Using the BAC calculator here, and guessing that she’s 150 pounds, and guessing that she consumed them in one hour, we find that… well… we don’t know. It only allows for 9 drinks in an hour and that’s only a 0.2624 BAC. The Police Notebook calculator, only goes up to 8 drinks. This calculator at Beertown, suggests something on the order of 25 beers in one hour. But reality suggests that the woman involved was not of average size nor average metabolism because the alcohol didn’t kill her. This chart from Texas doesn’t have anything close to the woman’s blood alcohol content in its evaluation of the range of lethal amounts. You are probably in a coma. The nerve centers controlling your heartbeat and respiration are slowing down, and it’s a miracle if you survive. The woman recently moved to South Dakota from Minnesota. Stories like this make me doubt the validity of BAC testing methods. The story doesn’t mention if this was a blood test, urine test, blow test, etc. I have a hard time believing someone could actually have 70% of their bloodstream be alcohol. Tyler, (personal attack removed). The human body has on average about 5-5.5 quarts of blood. 70% would be on the order of a GALLON of pure alcohol. .708 BAC would mean your blood stream is 0.708% alcohol, still not even 1%. the ability to consume inordinately insane amounts of alcohol is also effected by the liver’s practice schedule. Alcoholics can function with a much higher BAC than I can. And, btw, the BAC is actually a mass/mass or mass/vol concentration, which can conveniently be expressed also as %. then… this much alcohol will fit in a 734 cc container. 734 mL of pure alcohol is my average lethal dose. A standard “fifth” bottle of liquor is 750 mL. One then takes into account that commercial liquors are basically not pure alcohol. According to the label of my favorite distilled beverage (Glenmorangie Whisky), it’s only 40% (i.e., 80 proof). Ummmm…. I would have to drink almost 2 liters of it, pretty much all at once, to achieve this hepatological miracle. The sober mind boggles at the idea of spending that much money all at once. Another reason to drink expensive liquor – you can’t afford to drink that much of it at once.